INSTANT NEW YORK TIMES BESTSELLER 'I'd recommend John's book for anyone interested in becoming a better manager', Bill Gates'Management magic....Measure What Matters is a must read for anyone motivated to improve their organization' - Former Vice President Al Gore, chairman of the Climate Reality Project'Measure What Matters shows how any organization or team can aim high, move fast, and excel' , Sheryl Sandberg, Facebook COO and founder of Leanln.org and OptionB.org 'Measure What Matters deserves to be fully embraced by every person responsible for performance in any walk of life' - Jim Collins, author of Good to Great 'In this indispensable book, the most important venture capitalist of our era reveals a key to business innovation and success - Walter Isaacson, author of Steve Jobs and The Innovators 'Measure What Matters takes you behind the scenes for the creation of Intel's powerful OKR system - one of Andy Grove's finest legacies' - Gordon Moore, cofounder and former chairman of Intel --------The revolutionary movement behind the explosive growth of Intel, Google, Amazon and Uber. With a foreword by Larry Page, and contributions from Bono and Bill Gates. Measure What Matters is about using Objectives and Key Results (OKRs), a revolutionary approach to goal-setting, to make tough choices in business. In 1999, legendary venture capitalist John Doerr invested nearly $12 million in a startup that had amazing technology, entrepreneurial energy and sky-high ambitions, but no real business plan. Doerr introduced the founders to OKRs and with them at the foundation of their management, the startup grew from forty employees to more than 70,000 with a market cap exceeding $600 billion. The startup was Google. Since then Doerr has introduced OKRs to more than fifty companies, helping tech giants and charities exceed all expectations. In the OKR model objectives define what we seek to achieve and key results are how those top- priority goals will be attained. OKRs focus effort, foster coordination and enhance workplace satisfaction. They surface an organization's most important work as everyone's goals from entry-level to CEO are transparent to the entire institution. 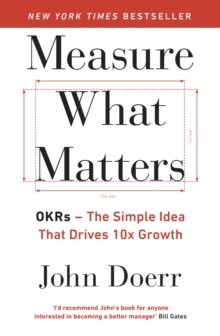 In Measure What Matters, Doerr shares a broad range of first-person, behind-the-scenes case studies, with narrators including Bono and Bill Gates, to demonstrate the focus, agility, and explosive growth that OKRs have spurred at so many great organizations. This book will show you how to collect timely, relevant data to track progress - to measure what matters. It will help any organization or team aim high, move fast, and excel. -------- John Doerr joined Kleiner Perkins Caufield & Byers in 1980 and has since backed some of the world's most successful entrepreneurs and companies, such as Google, Zynga and Amazon. John serves on the boards of Google, Zynga and Amyris. He also led KPCB's investment in Twitter. He is a member of the American Academy of Arts and Sciences, and was a member of U.S.
President Barack Obama's Council on Jobs and Competitiveness. He has 291K followers on Twitter. His TED Talk on greentech has 896K views.